NORTH EASTON, Mass. – Whatever Taunton head coach Brad Sidwell was selling at halftime, his defensive unit was buying. Taunton posted a second half shutout, limiting Oliver Ames to negative yardage on each of its first two drives and then stopped a late red zone attempt to seal a 13-12 win. “Our defense hung in there for us in the end,” Sidwell said. “We had to keep them in front of us to make the play. We turned the ball over too much on offense. And even though our defense didn’t force a turnover, they didn’t give up too many big plays. 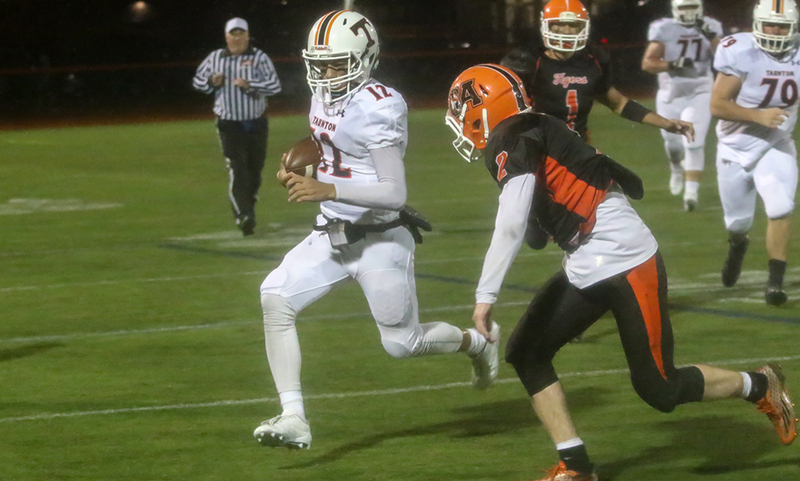 Oliver Ames had an ideal start to the game, scoring on each of their first two drives while Taunton had just 10 yards of offense on its first two series of the game. With the wind at its back, Oliver Ames’ defense came out blazing, forcing a three and out. Because of the wind, Taunton’s punt went just eight yards giving the hosts great field position at the Taunton 35-yard line. OA used eight plays to cover the 35 yards, with junior Anthony Berksza (19 carries, 94 yards, two touchdowns) cutting up the middle for a 4-yard touchdown. A two-point attempt was stuffed in the backfield by Taunton’s Nuno Camara but OA took a 6-0 lead with 4:29 left in the first. The hosts were back on offense just three plays later. Facing a third down, Taunton went to the air for the first time in the game but OA’s Michael Mulrean came away with the interception, giving the home team a first down at the Taunton 42-yard line. OA took advantage of good field position once again, using just six plays to double its lead. Highlighted by a 25-yard rush from Noah Fitzgerald on third down, the home-Tigers moved into the red zone. Three plays later, Berksza took the toss to the right and plunged across the goal line inside the pylon. Another two-point attempt was stopped but OA had a 12-0 lead with less than 10 minutes gone in the game. Taunton’s offense finally got in gear behind three straight runs from TJ Mendes (16 carries, 41 yards). Facing a fourth down at OA’s 20-yard line, Taunton went back to the air and junior Noah Leonard (4-for-11, 62 yards, two total touchdowns) hit classmate Wesner Charles for an 11 yard gain and a first down. Three plays later, Leonard used a QB sneak from two yards out to get Taunton on the board. A dropped snap on the extra point try resulted in a failed attempt, cutting the deficit to 12-6 with 4:19 left in the second quarter. OA received the kickoff to start the second half, but a chop block penalty on second down set the offense back and resulted in a punt into the win for just 16 yards. Taunton’s offense capitalized on the momentum its defense created and took a shot on the first play. Leonard dropped back and floated a perfect pass down the right sideline to senior Collin Hunter, who hauled in the pass and raced just inside the pylon for a 36-yard touchdown. John Teixeira‘s extra point put Taunton up 13-12 and ended up being the winning kick. The team’s traded punts after OA’s next drive went for negative yards (with big tackles from Edgardo Navarro-Cruz and Coryn Nompleggi) and Taunton’s drive stalled after a key third-and-one stop by OA. OA moved the ball into Taunton territory on its next drive, highlighted by a 28-yard burst by Berksza. But Taunton’s defense stopped OA for a loss, then a fumble on the handoff went for no gain. On fourth down, Taunton’s defense was able to stop the rush and force a turnover on downs. Taunton’s next drive didn’t result in points but did take nearly seven minutes off of the clock. Malik Richardson (nine carries, 37 yards) rushed for back-to-back first downs before Mendes took two straight carries for another first. Facing fourth and nine from OA’s 30-yard line, Leonard (six carries, 56 yards) took the carry himself, bolting for 12 yards to move the chains and keep Taunton’s drive alive. The visitors almost put the game away on a play action play but Leonard’s pass into the wind to senior lineman Alex Simon held up and the pass ended up incomplete despite a diving effort. Taunton tried to throw for the first on fourth down but OA’s Cobey Williamson came up with an interception and returned it to the OA 29-yard line. With just over five minutes to play, Berksza went for 28 yards on OA’s second play of the drive. Jay Fruci (13 carries, 56 yards) followed it up with a 29-yard dash, putting the ball at Taunton’s 11-yard line. Taunton’s defense then held OA for runs of four, one and two, setting up fourth down. OA elected to try a 21-yard field goal but it was just wide right with 1:45 to play. The visitors ran out the rest of the time as OA had no timeouts left. Taunton football (3-0 overall, 1-0 Hockomock) returns home to Aleixo Stadium next week to welcome Attleboro (0-3, 0-1) on Friday night. Oliver Ames (1-2, 0-1) will welcome Franklin (1-2, 0-1) to Muscato Stadium on Thursday night.